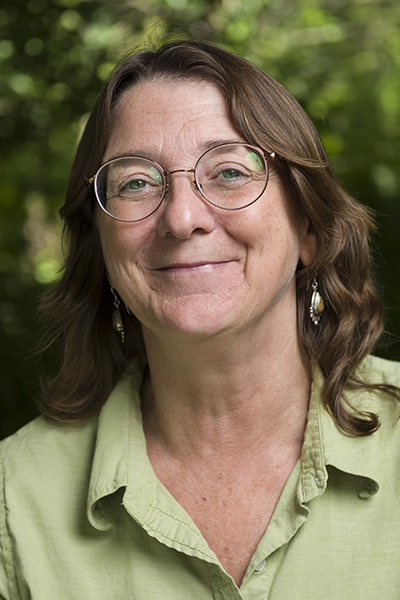 Kelly Smith won the town board election! It was a very close race and was decided by a handful of votes. Thanks for all of your help and support throughout the campaign! This entry was posted in election on November 17, 2013 by gracny. Remember to vote on Nov. 5! This entry was posted in election on November 2, 2013 by gracny. 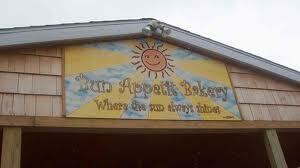 Kelly Smith and Neil Snyder, candidates for the Groton Town Board, will be at Bun Appetit (215 Main St., Groton) on Saturday, November 2, from 10am to noon. 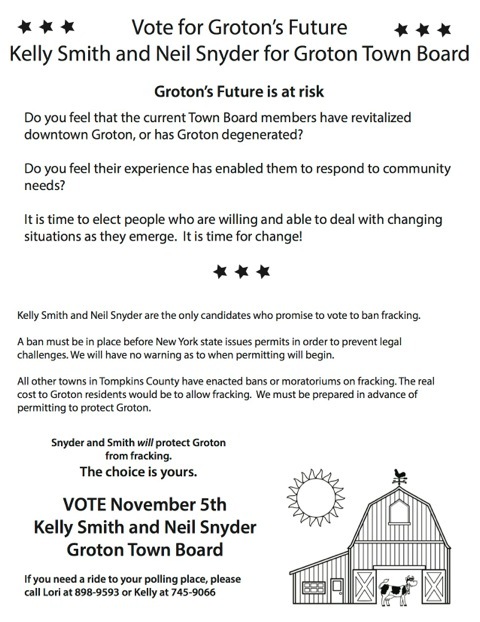 Kelly and Neil believe that the Town Board should be a resource committed to benefitting Groton residents. Come and share your thoughts about the challenges facing Groton and your hopes for Groton’s future. Be sure to vote on November 5! This entry was posted in election on October 26, 2013 by gracny. 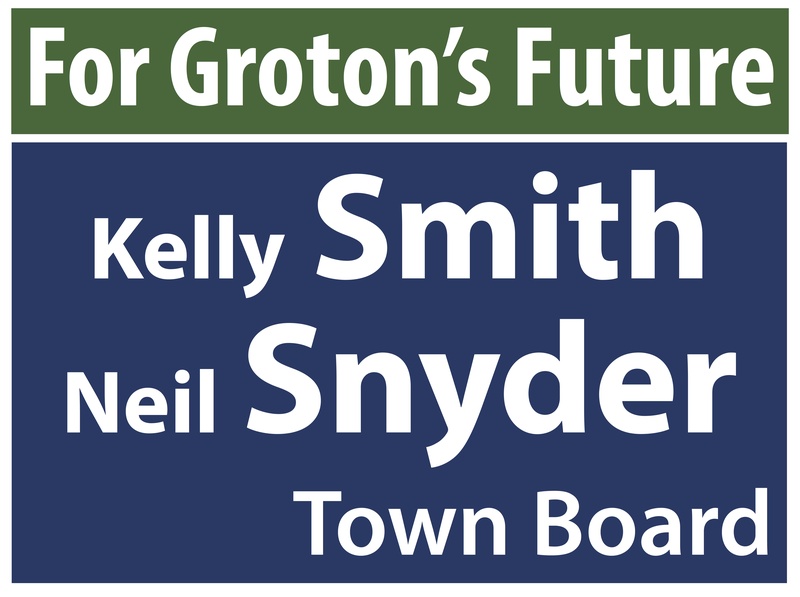 We are running for two seats on the Groton Town Board because we are concerned about many issues that the current Town Board has failed to address. The current Board members have become complacent, no longer responding to the community’s needs and concerns. The legacy of the Town Board incumbents is years of neglect. Groton deserves better and needs change! 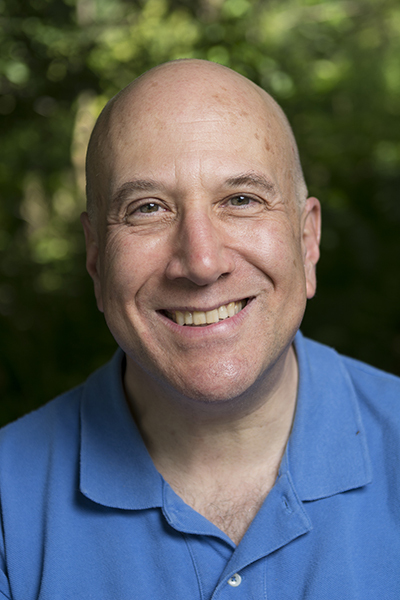 While all other towns in Tompkins County have recognized the dangers of hydro-fracking and have prohibited the process, the current Groton Town Board has failed to act. In states where fracking is occurring, there is evidence of water pollution and plummeting property values; the current Board refuses to respond to our concerns despite the fact that nearly 1000 Groton residents have signed a petition asking the Board to ban hydraulic fracturing. People pay relatively high taxes to live here and have the right to enjoy the peace and quiet of their property. Local zoning regulations protect some, but not enough, of those rights. Zoning needs to be strong, logical, and enforceable, especially when addressing public nuisances such as noise and traffic. The Town Board incumbents have repeatedly refused to address either issue. Despite laws which require government to be open and transparent, most issues effecting our town are discussed behind closed doors and through private emails. Most public board meetings last a matter of minutes, during which most agenda items are never discussed. We will strive to improve the lines of communication when it comes to town matters. We promise to remain accessible to all the residents of Groton and will listen to your concerns. 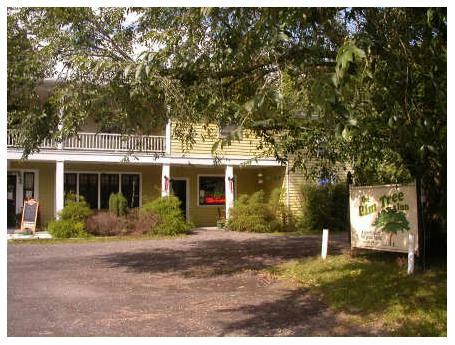 We love the beautiful, tranquil, rural character of Groton, but it needs revitalization. We will work hard to protect our community assets and strive to improve what could be better. By promoting healthy hometown values, and by listening to you, we hope to unify and strengthen our community. 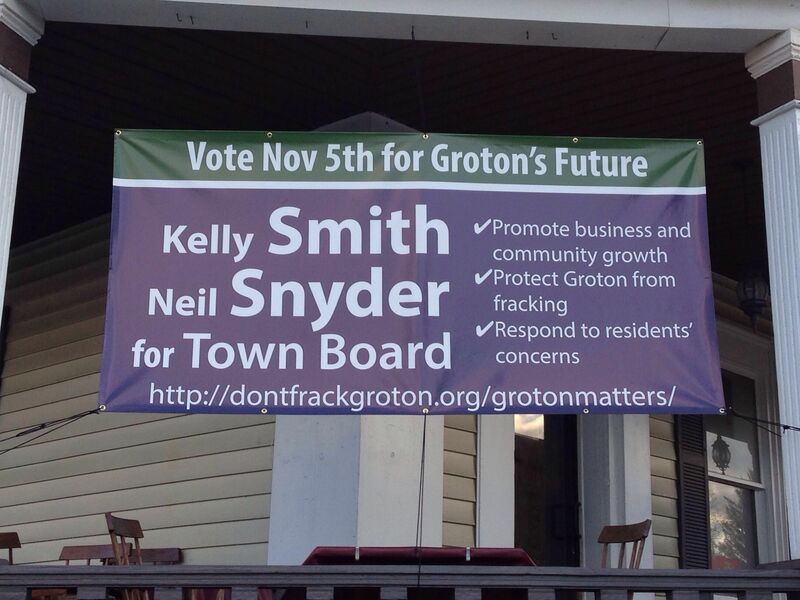 To change Groton politics and chart a positive course for the future, please vote for us on November 5th! This entry was posted in election on October 18, 2013 by gracny. On Sunday, Oct. 13 at 1:00pm at the Elm Tree Inn (2 McLean Rd, McLean), Kelly and Neil will host an afternoon of conversation about Groton, with dessert and coffee, and featuring a screening of the new film Triple Divide (http://tripledividefilm.org/about/), about the impact of fracking in rural Pennsylvania towns. All are welcome! We look forward to seeing you. This entry was posted in election on October 4, 2013 by gracny. Election lawn signs are here! Lawn signs are an excellent way to increase exposure for Kelly and Neil. Please show your support for their campaign and contact us to get a sign. This entry was posted in election on October 3, 2013 by gracny. 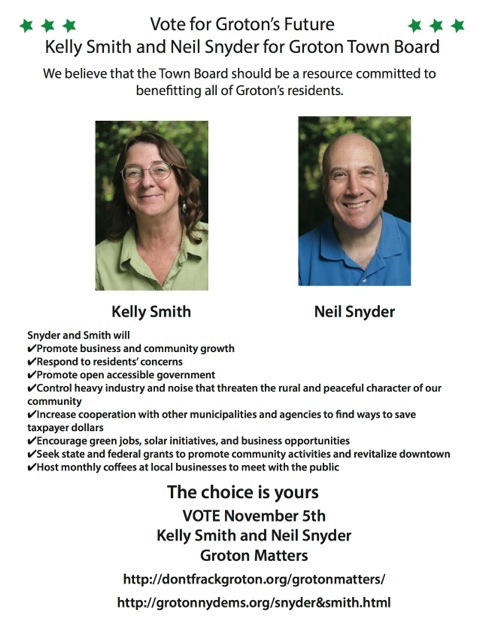 Kelly Smith and Neil Snyder, candidates for the Groton Town Board, will be at Bun Appetit (215 Main St., Groton) on Saturday, October 5, from 10am to noon. This entry was posted in election on September 30, 2013 by gracny.